It is very important to understand that of the separate autonomous movements in Latin America represent anything like a fully articulated road map to a future revolution. On the contrary, we find them rife with contradictions and imperfections. In Chiapas the autonomous region strives for what can, eventually, only be a suicidal accommodation with the Mexican state. In Argentina, empresas recuperadas and piquetero groups are lead into the peronist fold. In Bolivia, the governing MAS manages to coopt or marginalize one autonomous group after another. The MST in Brazil, and the autodefensas in Mexico, are pulled one way by established political parties, another by parties of the far left, and yet another by the Catholic church. Before deciding how we can orient ourselves in relation to these movements, we need to be realistic about the contradictions represented within them. One of the criticisms of autonomous movements, particularly from the traditional Latin American left, is that they are in the final analysis reformist movements. The criticism seems to have some basis if we look at the programs that some of these movements have put forward. The central demand of the piquetero movement in Argentina, for example, notwithstanding their militant tactics and direct confrontations with state power, is for an unemployment subsidy from the Argentine government—hardly a revolutionary proposition. Similarly, many of the original demands of the EZLN in Chiapas could conceivably be addressed within the framework of the existing Mexican social system. Within the thirty four points of the communiqué issued on March 1st, 1994, are calls for free and open general elections, general welfare provisions focused on health, land, and housing, and a demand for jobs. It is worth noting, however, that the adoption of the neo-Zapatista program as a whole—including regional and ethnic autonomy, the resignation of all current executives, debt annulment, the control of oil revenue by indigenous peoples, the revocation of the penal code, and the removal of all armed government forces from rural areas—would, if not constituting a revolution in its own right, certainly create a revolutionary situation. In such a situation, it is easy to imagine that the EZLN’s program might begin to take on a more frankly revolutionary posture. Another position that smacks of reformism is the way in which many autonomous movements have based their claims on provisions of the laws or the constitution of the countries where they are located. The MST, for example, cites a clause in the Brazilian constitution that requires that land be “socially productive” to justify the legality of their land occupations, while the EZLN ties its legitimacy to the Magna Carta of the Mexican Revolution, which provides for common lands for rural communities. Similarly, many occupied enterprises in Argentina connect the expropriation of workplaces to bills of unpaid wages owed by the former owner, rather than challenging the legitimacy of the system of private ownership as such. It is worth considering, however, whether such positions are, in essence, reformist, or whether they are pragmatic tactical adaptations which are made based on the actual possibilities for revolutionary change which are offered by the current political situation in which each movement finds itself. In spite of the criticism from the authoritarian left, the EZLN platform is not at all dissimilar to that of, say, the Chinese Communist Party as the Second World War drew to a close in 1945. Since 1937, the CCP had maintained an uneasy alliance with the governing Kuomintang, a party which sought to uphold ages-old patterns of feudal repression in China. It appeared very likely that the end of hostilities with Japan would lead to a conflict between the CCP and the Kuomintang, and in advance of peace talks between the two camps, the CCP issued a list of specific, minimum demands. Among these were a call for a democratic coalition government; rights of free speech, press and assembly, among other basic civil rights; the withdrawal of Kuomintang armies from areas adjacent to the CCP base areas; higher wages, unemployment relief, and the right of workers to organize; and recognition of all of the democratic parties and organizations operating in China. All of these demands have approximate correlates in the platform of the EZLN from 1994. There is one other parallel which is even more striking—a demand for autonomy for national minorities in China. As regards the land question, the CCP’s position was substantially to the right of the EZLN’s, and for that matter that of the MST in Brazil. There is not even a call in the CCP program for land reform or redistribution, but only for reductions of rent and interest and safeguards for the rights of tenants. As far as industry is concerned, the CCP’s program is to “Assist private industry and provide it with facilities for obtaining loans, purchasing raw materials and marketing its products”—an eminently reformist position, it would seem. Our purpose in comparing the two programs is neither to portray the CCP as reformist nor to justify or ally ourselves with reformist elements within the EZLN. The apparently reformist points in the Chinese program come in a specific historical context. The war with Japan was coming to an end. In the analysis of Mao Tse-tung and others, power couldn’t be taken, and, even more importantly, the economy couldn’t be developed, without the support of the national bourgeoisie. It was not at all clear that the CCP had the wherewithal to win a civil war against the Kuomintang, which had far the larger army and was being generously supplied with arms by the U.S. Above all, the country was perilously close to a devastating famine which made it imperative to avoid serious disruptions in agricultural production. All of these factors went into the elaboration of a platform that was much more moderate than the CCP’s platform had been prior to the anti-Japanese alliance. If we endorse the prudence of the CCP’s moderation in light of the prevailing conditions, we would be remiss in not giving the EZLN and other autonomous movements the same consideration. The conditions for victory in a civil war were hardly more propitious for the EZLN in Mexico in 1994 than they were for the CCP in China in 1945. Like the CCP, the EZLN was willing to negotiate, and like the Chinese they were provoked into action, in this case by Salinas de Gortari’s privatization of common lands (ejidos) in clear violation of the Mexican constitution, and by the looming threat of NAFTA to Mexico’s agricultural producers, when they might have preferred to wait. Once the uprising began, and the EZLN’s approximately 3,000 guerrillas confronted the armed might of the Mexican state, it became manifest that their best hope lay in the mobilization of domestic and international “civil society”, which turned out en masse in support of the neo-Zapatistas. In such a case, the pragmatic moderation of their program is no less to be admired than that of the CCP’s 1945 program. This doesn’t mean an “end of history” for the EZLN, or that they will not continue to evolve; and as far as their relationship with the Mexican state, their evolution could lead toward reformism or away from it. But it is significant that they have refused to negotiate with the Mexican government since 1996; that they have never laid down or turned in their weapons; that the armed expropriation carried out in the initial uprising has never been reversed; and, above all, that they have established and maintained an autonomous territory which responds to norms and rules that are in sharp contradiction with those of the feudal and capitalist society which surrounds it. In this situation of autonomy, the EZLN has been able to achieve the fulfillment of many of their original demands within the territory they control, as has been discussed above. We should remember, of course, that as far back at least as the Spanish Revolution, any time an autonomous or libertarian movement has shown any sign of circumspection or strategic thinking it has been accused of vacillation by the communist mainstream. Stalin can sign a pact with Hitler and later be celebrated as a diplomatic and military genius, but let the EZLN be pragmatic enough to desist from a currently unwinnable guerilla war—without turning over their weapons—and they are shrilly decried as “armed reformists”. While of course, we shouldn’t be surprised by this sort of distortion coming from the authoritarian left—it is their stock in trade—neither should we shouldn’t be taken in by it. This is not to say that there are not real concerns about reformism within the neo-Zapatista movement, or even that reformism isn’t one of its central currents. As will be discussed below, we don’t believe an autonomist’s role is simply to sit on the sidelines and cheer when Subcomandante Marcos says that “the Mexican state has abandoned its duty”—as though the duty of a bourgeois state was consonant with the aspirations of oppressed and working peoples. Until 2006, the EZLN never directly identified itself as “anti-capitalist”. Its model of marshaling support from “civil”, much of it liberal, society, has watered down its politics, at least publicly. There are also questions about the willingness of the EZLN to act in solidarity with other revolutionary movements inside Mexico. According to some sources there, the “Other Campaign” launched by the neo-Zapatistas in 2006 to “unite the anti-capitalist left” has never been a collaborative movement, but rather a call for support for neo-Zapatista activity beyond Chiapas. It is a fact that, due to the heterogeneity of autonomous movements, reformist and pragmatic elements are often operating side by side with, and in contradiction to, one another—and in contradiction, as well, to openly revolutionary elements within the same movement. It is for this reason that we can’t support these movements carte blanche as though they were made up of “comrades”—rather, we need to support those individuals, organizations and currents within them who actually are comrades, or we can indeed expect to see cooptation, either of the reformist or authoritarian variety. When we look at the movement of Empresas Recuperadas por los Trabajadores (or ERTs, worker-expropriated enterprises), for example, we need to know the difference between the Federacion Argentina de Cooperativas de Trabajadores Autogestionadas (FACTA), a federation of cooperatives connected to social movements, and an organization like the MNFRT (Movimiento de Fabricas Recuperadas por los Trabajadores), which replaces the usual ERT slogan of “ocupar, resistir, producir” with “trabajar, producir, competir”—work, produce, compete. One is a slogan that embodies within it the possibility of workers’ control of production; the other might be a memo from Walmart to their store managers. In this regard, a brief look at the relationship of autonomous movements to political parties is instructive. In Argentina, Brazil and Bolivia, there have been significant links forged between autonomous movements, or parts of them, and the populist political parties which have come to power in recent years. In the case of Bolivia, the governing MAS party developed concurrently with the social movements that eventually brought it to power. The essentially leaderless struggles in Cochabamba (around water) and El Alto (around gas) were what propelled Evo Morales into the presidency in 2005 with 54% of votes cast; in 2002, before the victory of the autonomous movements in those struggles, he had obtained only 20% of the vote. In spite of the importance of social movements to the electoral success of MAS, Morales has promoted policies—like the construction of a superhighway across indigenous lands—which have met with vigorous resistance. The most remarkable manifestation of the divergence between MAS and autonomous movements, and a convincing demonstration of the power of the latter, was the 2010 gasolinazo, a successful nationwide general strike against the end of the gasoline subsidy. The relationship of the MST in Brazil with the governing Workers’ Party (PT) is distinct from that of Bolivian social movements with MAS, though not dissimilar. The MST was created outside of the ambit of the PT, in large part by radical elements in the Catholic Church. Nevertheless, the MST supported the PT’s accession to power, and even endorsed Dilma Rousseff in the 2010 presidential election. It is worth pausing for a moment to reflect on this, because it shows the degree to which autonomous movements can be contradictory—a movement which declares itself autonomous, which speaks in candid terms about class struggle, whose members have on numerous occasions rejected the electoral process, endorsed the reformist candidate of a mainstream party that had bitterly disappointed advocates of serious land reform. 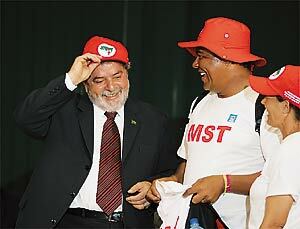 The MST was eventually forced, under Lula’s administration, to adopt a confrontational stance toward the PT. When Lula was first elected the MST halted its tactic of occupying government buildings, and limited its actions to private land occupations. As the PT’s model of development for the country began to take shape, however, it became clear that the party couldn’t and wouldn’t satisfy the demands of the MST, and occupations of government buildings resumed, side by side with other tactics of direct confrontation with the PT government and its agents. Certainly it seems likely that there were and are elements within the MST with ties to the PT’s left wing, elements that are willing to be used as a direct action pressure group on the government. This is similar to the situation of the workers at SIDOR in Venezuela, who allied with the chavista left in the labor movement against the entrenched bureaucrats of their own party. Nevertheless, it appears likely that, because of the reformist intransigence of the PT’s mainstream, a movement like the MST which aggressively promotes land occupations and worker-peasant alliance will move increasingly to the left—and away from the bourgeois electoral process. The case of Argentina has been different from that of Bolivia or Brazil, although the common factors of clientelism and cooptation are present. Within the Argentine movement, however, forged as it was in the political and economic crisis of 2001 when all the mainstream parties were discredited, there is a consciously and doggedly autonomous faction which explicitly rejects alliances with political parties as a matter of principle. Nevertheless, it should once again be emphasized that autonomous movements are not fully articulated movements or any kind of finished product; they are places where struggle is taking place from day to day over whether oppressed people and working people will remain in control, or whether one or another opportunist tendency will once again channel our energy into attaining their own ends. Certainly, peronists have not ceased their efforts to control and coopt the empresas recuperadas into a system of patronage. They haven’t stopped attempting to control the MTDs in the same way. At the beginning of the piquetero movement, there were MTDs that were made into clients, and bought off with jobs and food in a way that would have been equally pleasing to Peron and Balaguer. When Nestor Kirschner became president, and the cooptation of autonomous movements began in earnest, we even see phenomena such as the existence of an “MTD Evita”. Nevertheless, the piquetero movement remains the most militant expression of resistance to neoliberalism in Argentina, and there are elements operating within it, like the Federacion de Organizaciones de Base, which proponents of working class autonomy can wholeheartedly support.